Well, I was wrong. It was a bargain. It’s got a forehead rest and the side pieces don’t hurt my ears. I don’t need the built-in LEDs when I am using my lamp, so leaving the batteries out makes the body so light I can wear it for as long as I like. 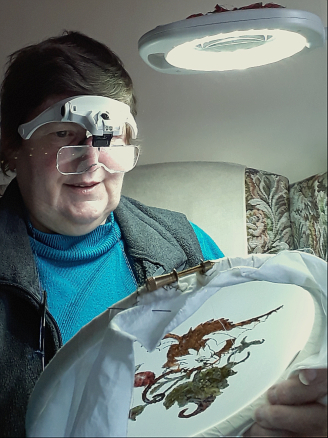 And it has adjustable, well made lenses: the 2.0x seems about perfect for a comfortable working distance when stitching with a hoop in the hand. The magnifier is supplied by Shesto Ltd and called “LightCraft 5 Lens Magnifier Set”. (I have spotted other brand names for the same device on the Web.) It comes with a headband which can be used instead of the side pieces, but I have not tried that yet, I am comfortable enough already. On the downside, the headpiece doesn’t leave much room for wearing normal glasses under it. I don’t need my reading glasses when I use it, I can see beautifully clearly. But for anyone with prescription lenses, this might not be an good choice. It also makes you look very weird, although hopefully less strange than this person on the packaging! What is he or she thinking? The LED is quite blue compared to my daylight lamp. It is very bright, good for seeing but not much use for choosing colours. With the 3 AAA batteries in place, the magnifier is heavier. Not too heavy for a short stitching session, but you certainly know that you are wearing it. And the thing doesn’t pack very flat: I will continue to use spectacles for carry-around projects, where I am not usually in need of much magnification. 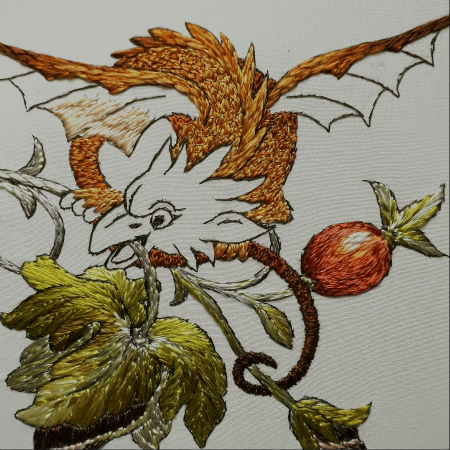 But back in my stitching chair – Oh, the luxury of seeing my silk embroidery so clearly and so easily! As a result there has been further progress on the dragon. I still have the feet, wings and head left, so there’s plenty more stitching to do before it’s finished. There’s not much point in showing you the current state of the stitched box, as I am still working on the base sides – I’m on the fourth now, so I must start thinking about the design for the top. And before I run back to my stitching chair, I must say a quick hello to a number of new readers of Tortoise Loft – The Blog. You are very welcome. So are comments: don’t be afraid to say something, make suggestions or ask questions. I don’t bite, honest! – Even if I do look a bit scary in that magnifier. This entry was posted on January 22, 2019 at 9:02 pm and is filed under everyday life, Needlework with tags happy stitcher, magnifier, strange looking people. You can follow any responses to this entry through the RSS 2.0 feed. You can leave a response, or trackback from your own site. I usually wear stronger-than-normal readers for embroidery – +2.0 for everyday reading, KRin, but wear +3.00 or +3.5 for embroidery. Sometimes two pairs at once for really fiddly stuff! 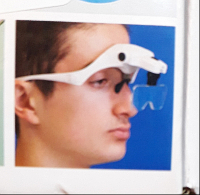 The joy of this device is that it’s strong enough for me to see clearly without any. But I am not trying to look from fabric to chart to fabric – that might take some rearranging of the furniture. What a clever little device Sue! I am still very fortunate to see clearly with my normal contact lenses. But I am always Reading these reviews with much interest as many of my students are quite a bit older and do struggle. This one wouldnt suit everyone, but it’s fine for my eyes. It does rather channel Seven of Nine, but anything that makes stitching easier and more comfortable has to be good. The dragon is looking rather thrilled with all the attention! It is starting to come together now. Fingers-crossed I can don’t ruin it with a rush to finish it.